How many rows are in the orchestra and balcony? Are there discounts for seniors, students, and children? What time do doors open before a performance? 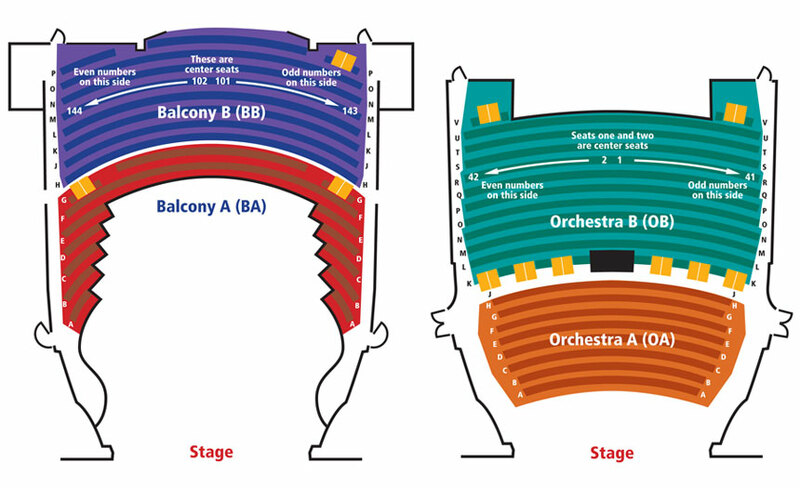 Where are you located in the Performing Arts Center? Where are you located in Dearborn? Do you sell tickets the night of a performance and for how long? Where do you park the night of a performance? Do you have assisted hearing devices? There are 22 rows in the orchestra and 15 rows in the balcony. Yes there is an elevator that can be accessed from all levels of the theatre. It is located at house left. In orchestra A, rows C through H, the middle 20 seats. In balcony A, rows F and G, the middle 30 seats. There are really no "bad" seats in the 1,200 seat venue. Discounts may be available for certain performances. Please call the Center Box Office to inquire if a discount is available. Yes we do. Call the Box Office (313.943.2354) with your name and address. Or sign up to receive news by email. The house doors open to permit seating a half hour before the performance. The theater and box office are located at the north west corner of the building. We are located at 15801 Michigan Avenue just west of Greenfield and about a half a mile from Southfield next to the Dearborn Police Station. Box office hours are: Tuesday through Saturday from 11 a.m. to 7 p.m. It is also open one hour prior to the start of the performance. We are open on Saturday and only on Sunday if there is a performance. We do sell tickets starting 2 hours before a performance and through to one hour after curtain. Yes we do they are available free of charge through the theater box office with a form of identification before a performance. No, holding tickets is unavailable.